Not to be confused with Public service, Alternative civilian service, or the album. An international civil servant or international staff member is a civilian employee who is employed by an intergovernmental organization. These international civil servants do not resort under any national legislation (from which they have immunity of jurisdiction) but are governed by internal staff regulations. All disputes related to international civil service are brought before special tribunals created by these international organizations such as, for instance, the Administrative Tribunal of the ILO. 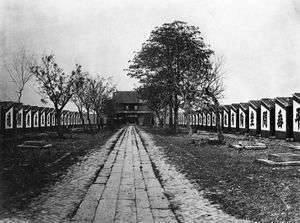 Imperial Civil Service Examination hall with 7500 cells in Guangdong, 1873. In theory, the Chinese civil-service system provided one of the major outlets for social mobility in Chinese society, although in practice, due to the time-consuming nature of the study, the examination was generally only taken by sons of the landed gentry. The examination tested the candidate's memorization of the Nine Classics of Confucianism and his ability to compose poetry using fixed and traditional forms and calligraphy. In the late 19th century the system came under increasing internal dissatisfaction, and it was criticized as not reflecting the candidate's ability to govern well, and for giving precedence to style over content and originality of thought. The system was finally abolished by the Qing government in 1905 as part of the New Policies reform package. In the 18th century, in response to economic changes and the growth of the British Empire, the bureaucracy of institutions such as the Office of Works and the Navy Board greatly expanded. Each had its own system, but in general, staff were appointed through patronage or outright purchase. By the 19th century, it became increasingly clear that these arrangements were falling short. "The origins of the British civil service are better known. During the eighteenth century a number of Englishmen wrote in praise of the Chinese examination system, some of them going so far as to urge the adoption for England of something similar. The first concrete step in this direction was taken by the British East India Company in 1806." In that year, the Honourable East India Company established a college, the East India Company College, near London to train and examine administrators of the Company's territories in India. "The proposal for establishing this college came, significantly, from members of the East India Company's trading post in Canton, China." Examinations for the Indian 'civil service'—a term coined by the Company—were introduced in 1829. 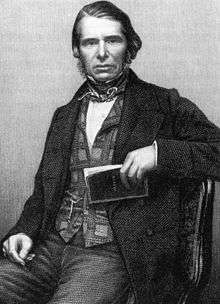 In 1853 the Chancellor of the Exchequer William Gladstone, commissioned Sir Stafford Northcote and Charles Trevelyan to look into the operation and organisation of the Civil Service. Influenced by the Chinese Imperial Examinations, the Northcote-Trevelyan Report of 1854 made four principal recommendations: that recruitment should be on the basis of merit determined through competitive examination, that candidates should have a solid general education to enable inter-departmental transfers, that recruits should be graded into a hierarchy and that promotion should be through achievement, rather than 'preferment, patronage or purchase'. It also recommended a clear division between staff responsible for routine ("mechanical") work, and those engaged in policy formulation and implementation in an "administrative" class. The report was well-timed, because bureaucratic chaos during the Crimean War was causing a clamour for the change. The report's conclusions were immediately implemented, and a permanent, unified and politically neutral civil service was introduced as Her Majesty's Civil Service. A Civil Service Commission was also set up in 1855 to oversee open recruitment and end patronage, and most of the other Northcote-Trevelyan recommendations were implemented over some years. The Northcote-Trevelyan model remained essentially stable for a hundred years. This was a tribute to its success in removing corruption, delivering public services (even under the stress of two world wars), and responding effectively to political change. It also had a great international influence and was adapted by members of the Commonwealth. The Pendleton Civil Service Reform Act established a modern civil service in the United States, and by the turn of the 20th century almost all Western governments had implemented similar reforms. Civil servants in Brazil (Portuguese: servidores públicos) are those working in the executive, legislative, and judicial branches of the federal, state, or municipal government and the government of Brasilia, including congressmen, senators, mayors, ministers, the president of the republic, and workers in government-owned corporations. Career civil servants (not temporary workers or politicians) are hired only externally on the basis of entrance examinations (Portuguese: concurso público). It usually consists of a written test, while some posts may require physical tests (like policemen) or oral tests (like professors, judges, prosecutors and attorneys). The rank according to the examination score is used for filling the vacancies. Entrance examinations are conducted by several companies with a government mandate, such as CESPE (which belongs to the University of Brasilia) and the Cesgranrio Foundation (which is part of the Federal University of Rio de Janeiro). The posts usually are ranked by titles, the most common are technician for high school literates and analyst for undergraduates. There's also higher post ranks like auditor, fiscal, chief of police, prosecutor, judge, attorney, etc. Those titles may require a master's degree or doctorate. One of the oldest examples of a civil service based on meritocracy is the Imperial bureaucracy of China, which can be traced as far back as the Qin Dynasty (221–207 BC). However, the civil service examinations were practiced on a much smaller scale in comparison to the stronger, centralized bureaucracy of the Song Dynasty (960–1279). 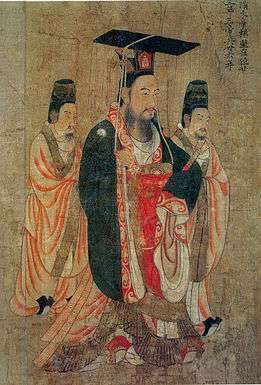 In response to the regional military rule of jiedushi and the loss of civil authority during the late Tang period and Five Dynasties (907–960), the Song emperors were eager to implement a system where civil officials would owe their social prestige to the central court and gain their salaries strictly from the central government. This ideal was not fully achieved since many scholar officials were affluent landowners and were engaged in many anonymous business affairs in an age of economic revolution in China. Nonetheless, gaining a degree through three levels of examination—prefectural exams, provincial exams, and the prestigious palace exams—was a far more desirable goal in society than becoming a merchant. This was because the mercantile class was traditionally regarded with some disdain by the scholar official class. Arbeiter in public service work mostly in low-skilled jobs such as construction, waste collection or manual office work. In some cases, training is not obligatory. Angestellte work in technical, vocational, and office work in a very large range of occupational fields. In most cases, they have received training aside from their government agency prior to employment- for example, they learned to program computers before a government agency hired them to do that. Arbeiter and Angestelle work with individual contracts, while Beamte are appointed, employed, and removed by the Public Sector Service and Loyalty law (öffentlich-rechtliches Dienst- und Treueverhältnis). In Pakistan a Competitive examination is conducted by FPSC for Central Superior Services of Pakistan and other Civil service, it was inherited from Indian Civil Service (British India). In Pakistan, there are federal civil services, for serving in federal government offices. They are selected through federal public service commission. similarly provinces select their own public services through provincial public service commissions.The federal services have some quota against provincial posts. while provincial services have some quota in federal services. The number shown represents the number of thousands of people who are employed. 278 is 278,000 people. In the United States, the civil service was established in 1871. The Federal Civil Service is defined as "all appointive positions in the executive, judicial, and legislative branches of the Government of the United States, except positions in the uniformed services." (5 U.S.C. § 2101). In the early 19th century, government jobs were held at the pleasure of the president — a person could be fired at any time. The spoils system meant that jobs were used to support the political parties. This was changed in slow stages by the Pendleton Civil Service Reform Act of 1883 and subsequent laws. By 1909, almost two thirds of the U.S. federal work force was appointed based on merit, that is, qualifications measured by tests. Certain senior civil service positions, including some heads of diplomatic missions and executive agencies are filled by political appointees. Under the Hatch Act of 1939, civil servants are not allowed to engage in political activities while performing their duties. As of January 2007, the federal government, excluding the Postal Service, employed about 1.8 million civilian workers. The federal government is the nation's single largest employer, although it employs only about 12% of all government employees, compared to 24% at the state level and 63% at the local level. Although most federal agencies are based in the Washington D.C. region, only about 16% (or about 284,000) of the federal government workforce is employed in this region. The European Civil Service is the civil service serving the institutions of the European Union, of which the largest employer is the European Commission. ↑ "China's Examination Hell: The Civil Service Examinations of Imperial China". History Today. Retrieved October 25, 2011. ↑ "Imperial China: Civil Service Examinations" (PDF). Princeton University. Retrieved October 25, 2011. 1 2 "Confucianism and the Chinese Scholastic System: The Chinese Imperial Examination System". California State Polytechnic University, Pomona. Retrieved December 7, 2011. ↑ Roberts, J. A. G. (1999). A Concise History of China. Cambridge, MA: Harvard University Press. ISBN 0-674-00075-7. ↑ "Chinese civil service". Encyclopædia Britannica. Retrieved December 7, 2011. ↑ Brook, Timothy (1999). China and Historical Capitalism. New York: Cambridge University Press. ISBN 0-521-64029-6. 1 2 3 Bodde,, Derke. "China: A Teaching Workbook". Columbia University. ↑ Mark W. Huddleston, William W. Boyer (1996). The Higher Civil Service in the United States: Quest for Reform. University of Pittsburgh Press. p. .
↑ Walker, David (2003-07-09). "Fair game". London: The Guardian. Retrieved 2003-07-09. ↑ Naithani, Sadhana (2006). In quest of Indian folktales: Pandit Ram Gharib Chaube and William Crooke. Indiana University Press. p. 6. ISBN 978-0-253-34544-8. ↑ "Concurso Público In Brazil". 1 2 Government of Canada. "Population of the Federal Public Service". Her Majesty the Queen in Right of Canada. Retrieved 25 June 2016. ↑ "Los funcionarios trabajarán 37,5 horas y su sueldo sigue congelado | Política | EL PAÍS". Politica.elpais.com. Retrieved 2014-02-18. ↑ "2012 Census of Governments: Employment Summary Report" (PDF). United States Census Bureau. 6 March 2014. Retrieved 8 December 2014. ↑ "Federal Government, Excluding the Postal Service". Bureau of Labor Statistics. March 12, 2008. Archived from the original on 2009-01-14. ↑ "Louisiana State University Libraries - Federal Agency Index". Lib.lsu.edu. 2009-09-15. Archived from the original on 2014-09-24. Retrieved 2014-02-18. "Civil Service". New International Encyclopedia. 1905.